Boil pasta in salted water according to directions. Rough chop and steam cauliflower (or boil) till tender. Set aside. Add 1 tablespoon oil to a small frying pan and toast breadcrumbs, careful not to burn them. Set aside. In a large frying pan sauté anchovies in olive oil til the begin to desolve. Add onions and cook on medium heat till golden. Add steamed cauliflower and mix well. Drain pasta, reserving 1 cup water and toss into cauliflower mix. Add 1/2 cup of water to pasta, toss and split between 6 plates. Top each bowl with toasted breadcrumbs, parsley and freshly ground pepper. found this from Gina's Skinny Recipes, can't wait to try it! 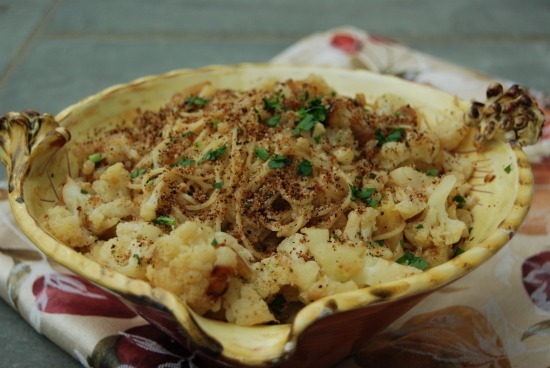 My kids love cauliflower and pasta, but I never thought of putting them together before! My 9 year old son made this with me tonight, my family LOVED it! Can't wait to try more of your recipes, thanks for sharing! JULIA LOVE THESE RECIPES ..... THEY ARE LIKE MY FAMILIES BUT LIKE YOU SAY LIGHTER. i DONT KNOW IF YOU REMEMBER ME MY NAME IS ANGELA AND I WENT TO GRAMMAR SCHOOL WITH YOUR SISTER JOSIE. MY BROTHER STEVE WAS IN YOUR CLASS. WE MOVED TO VA IN 1886 I WAS IN 9TH GRADE . I DID 2 WEEKS AT STELLA MARIS. WRITE ME BACK IF YOU CAN. angela pallazo? the one with the elevator in her house? yes i remember you. how are you?